One unexpected result of the Arab upheavals has been the renewed relevance of the 22-member League of Arab States. Long denigrated as a largely toothless organization, "a cross between the forces of fiction and futility," the league became an integral part of the diplomatic maneuvering in a number of areas. It provided crucial legitimacy for the Western intervention that led to the overthrow of Mu'ammar al-Qaddafi, supported the Gulf Cooperation Council's ultimately successful effort to force Yemeni president Ali Abdullah Saleh to relinquish power, and has been active in trying to resolve the Syrian crisis. 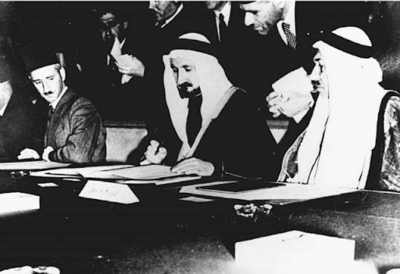 Saudi Arabian sheikh Yusuf Yassin (center), the acting minister for foreign affairs, signs the League of Arab States charter in Cairo, Egypt, March 1945. The Arab League was inaugurated ostensibly to promote greater inter-Arab cooperation, but in reality, it was created largely in opposition to the Zionist enterprise in Mandate Palestine. Its influence has waxed and waned over the decades; its accomplishments have been few and far between. Why the change? On one level, most ruling Arab elites, cognizant of the widespread sympathy for the protest movements, find it necessary and useful to demonstrate their attentiveness to the public mood, at least when it comes to supporting protest movements elsewhere. But at base, the league's actions have been not so much a result of the "Tahrir spirit" as of the hardheaded, geopolitical calculations by the bloc of mostly monarchical Sunni Arab states headed by Saudi Arabia and Qatar. Its successes, and limitations, provide a window into the current state of inter-Arab and regional dynamics at a time of great uncertainty. The league was founded in March 1945 to promote closer political and economic cooperation between newly emerging Arabic-speaking states in the name of an overarching pan-Arab identity; but the organization has generally failed to achieve anything more than ad hoc collaboration between its members, and the bulk of its resolutions and decisions have not been implemented. The deep fissures and rivalries among the Arab states, as well as the limitations on the capabilities of Egypt, the driving force of the new organization, insured that the league would fail to develop a strong institutional framework. The inability to require recalcitrant members to accept the will of the majority generally necessitated the search for the lowest common denominator, thus invariably watering down the league's resolutions and often denuding them of meaning entirely. For much of its history, the league, headquartered in Cairo and perpetually headed by a senior Egyptian diplomat, served as an appendage of Egyptian foreign policy and a tool to promote Egypt's self-designated status as the leader of the Arab world. Nonetheless, Arab League summit conferences—the league's de facto supreme decision-making body—have occasionally produced significant outcomes: the 1964 creation of the Palestine Liberation Organization and its endorsement as the sole legitimate representative of the Palestinian people ten years later; the 1978 suspension of Egypt following its peace accords with Israel; and, perhaps most importantly, the 1990 condemnation by a bare majority of Arab states of Saddam Hussein's invasion of Kuwait and support for the U.S.-led military coalition that would ultimately evict him from the emirate. Over the past decade, Arab summit conferences faded into irrelevance. This was particularly visible at the 2004 summit hosted by Tunisia's autocratic president Ben Ali, which proclaimed a commitment to comprehensive reform of political life, including the establishment of genuine democracy and freedom of expression, thought and belief. The Arab regimes' inability and unwillingness even to begin a process of genuine reform provided an important backdrop to the 2011 uprisings. Meanwhile, the centers of power in the Middle East were ever more firmly located in non-Arab capitals—Ankara, Tehran, and Jerusalem. The gathering storm in Tunisia rendered most Arab leaders speechless, apart from Qaddafi, who expressed the hope that Ben Ali would succeed in restoring order. Momentarily, the Libyan dictator was on the same side of the fence as the conservative Arab monarchies led by Saudi Arabia, as well as the Egyptian and Algerian ruling elites. But this would not last. As the protest movements spread, the six-nation Gulf Cooperation Council (GCC) quickly emerged as the only cohesive bloc of Arab states. Having banded together in 1981 in the shadow of the Iran-Iraq war, this club of pro-Western, oil-rich, tribally-based, geopolitically vulnerable monarchies has generally been like-minded on major strategic issues while not being free of differences and rivalries, due particularly to the gadfly role embraced by Qatar. In this regard, the Doha-based al-Jazeera TV's constant coverage of the protests in Tunis and Cairo was crucial in building their momentum to the extreme displeasure of Riyadh. For the Saudi leadership, the toppling of Ben Ali, to whom it quickly gave asylum, was bad enough. The overthrow three weeks later of Egyptian president Husni Mubarak, the Saudis' prime regional ally for more than twenty years, shook them profoundly, all the more so in light of what they viewed as the Obama administration's failure to stand firmly behind him. The GCC states' response was multi-pronged, focusing on the next three emerging hot spots—Bahrain, Libya, and Yemen—while concurrently pumping billions of dollars into their own societies to neutralize potential unrest. Bahrain, of course, was one of their own, a member of the club. Unlike the others, however, it had a marginalized Shiite majority. Hence, the Saudis viewed the unrest there not through the lens of civic assertion, as it was seen in the West, but rather as a religious-communal struggle with potential to inflame the Saudis' own Shiite population in the kingdom's Eastern Province. Moreover, the Bahrain crisis also carried profound geopolitical ramifications: Periodic Iranian claims to Bahrain and Tehran's vocal support for the Bahraini protestors posed a mortal danger in Saudi eyes—the extension of Iranian power and influence across the Persian Gulf and onto the peninsula itself. Hence, for GCC members, the choice was clear. Blatantly ignoring Washington's advice to engage with the protestors' demands, Bahrain's King Hamad welcomed the deployment in March 2011 of approximately a thousand mostly Saudi armed forces, together with smaller contingents from other GCC states. Their presence gave him sufficient backing to crack down hard on the protests, bringing them to an end. Whereas the purpose of the GCC's Bahrain policy was to restore the status quo, stabilizing Yemen—Saudi Arabia's soft underbelly on its southeast border—necessitated delicate mediation over many months. The end result, the removal of Saleh and his replacement by his vice president, was the optimal outcome for the time being. Libya, however, was another story. As opposed to intervening to preserve the status quo as in Bahrain, or to brokering a leadership change while maintaining the regime as in Yemen, the GCC's goal in Libya was to demolish Qaddafi's personal rule. The Libyan ruler had never made any bones about his disdain for the gulf monarchies: His media had branded the late Saudi King Fahd the "pig of the peninsula," and Qaddafi and Saudi King Abdullah had exchanged personal invectives on a number of occasions in recent years at Arab summits, in front of the television cameras. Sensitive to charges that ruling elites, and especially conservative pro-Western Arab monarchies, were opposed to the demands for reform from Arab societies, Arab monarchs consequently jumped at the chance to support the Libyan uprising. Of course, the challenge of toppling Qaddafi was of an entirely different order of business than in Bahrain or Yemen. At best, the GCC states could only play a supporting role, and the heavy lifting could be done only by Western powers and the Libyan opposition itself. To that end, Saudi Arabia and Qatar activated the Arab League, a matter of no small irony, as Qaddafi had hosted the annual Arab summit conference in his home town of Sirte just one year earlier. Accordingly, on February 22, 2011, the league condemned the Libya government's violent crackdown of the protesters and suspended it from participation in league meetings. This marked the first occasion when a league member had been barred due to actions taken against its own citizens within its sovereign territory, and it portended further measures. On March 12, as Qaddafi threatened to reconquer the rebellious eastern region of the country and hunt down his opponents "like rats," Doha and Riyadh spearheaded an Arab League resolution calling on the U.N. Security Council to impose a no-fly zone to protect Libyan civilians from Qaddafi's promised retributions. Reminiscent of the 1990 Arab summit's action against Saddam Hussein, the league's appeal to the Security Council provided vital Arab legitimacy for Western governments' subsequent actions. One difference between the two episodes was that, in 1990, much of the Arab "street" was infuriated with the move. This time, the "street" and the considerations of most governments had converged. Qatar and the United Arab Emirates would even provide small contingents from their respective air forces to participate in the NATO-led attacks on Qaddafi's forces, and the two countries, along with Kuwait, recognized the rebels' Transitional Council as the legitimate Libyan government well before Qaddafi's ultimate capture and summary execution on October 20, 2011. To be sure, one could hardly speak of a large, activist anti-Qaddafi Arab bloc. Only five other countries besides the six GCC states actually attended the league meeting—only half of the total member states. Nor was support for the U.N. Security Council resolution unanimous: The Syrian and Algerian foreign ministers, and reportedly the Sudanese and Mauritanian ones as well, expressed their unhappiness about endorsing international intervention in Libya's internal affairs and warned of the consequences. Indeed, outgoing league secretary-general Amr Moussa backtracked on the league's decision just a few days later as it became clear that NATO's mission was not just humanitarian but ultimately directed at achieving a regime change. But Moussa's statement had no discernible impact on the course of events, confirming anew that it was the GCC bloc that held the decisive weight in the league at that moment, and that NATO and the GCC, having attained what they needed from the league mechanism, could proceed apace. During its first decades of existence, Syria was a weak state that suffered from chronic political instability, internal schisms, and a lack of cohesion. As such, it was the object of rival regional and international ambitions which, in turn, further destabilized domestic political life. This weakness stood in contrast to Damascus's claim to regional leadership as the "beating heart of Arabism," used by Syrian leaders as a legitimating tool vis-à-vis both domestic and regional rivals. The outcome of this explosive cocktail was the 1967 Six-Day War with Israel, the final blow to the dream of radical pan-Arabists. Hafez Assad's ascent to power in 1970 gradually inaugurated a new era. Syria became a brutal, albeit relatively stable mukhabarat (intelligence and security services) state with its leaders indulged and all opposition crushed as in Hama in 1982. Systematic repression was accompanied by alliances between the Alawite core of the regime, the Sunni merchant classes, and the Christian religious minorities, who valued the stability provided by the regime. Regionally, Syria became a full-fledged actor, incorporating Lebanon into its sphere of influence and seeking to do the same with the Palestinians and Jordan while maintaining a hard-line position toward Israel. While Damascus continued to declare adherence to the principles of Arab nationalism, its alliance with non-Arab revolutionary Islamist Iran beginning in 1979 placed it in an awkward, minority position among Arab states, particularly during the Iran-Iraq war. But the alliance, often viewed by outsiders as unholy and unnatural, proved to be extremely durable even as Syria joined the pragmatic pro-Western Arab camp led by Egypt and Saudi Arabia in helping to reverse the Iraqi occupation of Kuwait in 1990-91 and participated in the Arab-Israeli peace process during the 1990s. Under Bashar al-Assad, however, the delicate balance that his father had usually maintained between Iran and conservative, pro-Western Arab states was abandoned in favor of deeper ties with Tehran and enhanced support for non-state violent Islamist movements (Hezbollah, Hamas, and Islamic Jihad). Even as he officially subscribed to the Arab League's 2002 peace initiative, Bashar was dismissive of it and of its Arab advocates. Syrian relations with other Arab states reached a new low point during the 2006 Israel-Hezbollah war when Bashar scorned Mubarak and the Saudi and Jordanian kings as "half men" for blaming Hezbollah and Iran for starting the conflagration. It was largely thanks to the Syrian-Iranian alliance that Tehran was able to project power into the eastern Mediterranean region—in Lebanon, the Damascus-based Palestinian organizations, and the Egyptian Sinai—in a manner unprecedented since ancient times. Following the uprising in Tunisia and in the midst of the protests in Egypt and Bahrain, Bashar gave a memorable interview to The Wall Street Journal, in which he explained that Syria was immune from unrest because, unlike elsewhere, his policies were in tune with the Syrian people's desire to promote "resistance." Within a few short weeks, however, this gloating proved to be profoundly misconceived. More than a year and 9,000 fatalities later, Assad's regime is fighting for its life and is estranged to an unprecedented degree from nearly all Arab states. In particular, the conservative Arab monarchies, facing their own restless populations, find it useful to identify with the predominantly Sunni Muslim Syrian opposition. Even more importantly, they recognize that the fall of the house of Assad would be of a different order of magnitude than that of Qaddafi. Having failed for three decades to pry Syria loose from the Iranian embrace, the prospect of regime change, in favor of a Sunni-dominated government more attuned to Saudi, Turkish, Egyptian, and Western sensibilities and interests (not that these are identical, by any means) is extremely enticing. Tehran recognizes what is at stake as well. A visit in January 2012 of an Iranian Revolutionary Guard Corps commander to Damascus confirmed that Tehran is providing military aid to Syria to help suppress the uprising. Hezbollah, Iran's main client in the region, is undoubtedly involved in the effort. Many months would pass before the bridges would be entirely burned between Assad and the anti-Iranian, Arab Sunni bloc. Indeed, one of the first acts by the new Arab League secretary-general Nabil al-Arabi upon officially assuming his post in July 2011, after Moussa stepped down to run for the Egyptian presidency, was to meet Assad in Damascus. There he denounced "foreign intervention" in Syria, and specifically, U.S. president Barack Obama for declaring that Assad had lost all legitimacy. At that point in time, a reform process that Assad had pledged to implement appeared to Arabi to be the best hope for avoiding a conflagration in Syria. But the belief in Assad's commitment to reform withered away in subsequent months. A few weeks after condemning Obama, and just one day after a GCC condemnation of the Syrian regime's actions, Arabi issued an official statement expressing concern over the deteriorating situation in Syria and urged the government to end its violent repression of the opposition. On that same day, August 7, Riyadh withdrew its ambassador from Damascus and was followed hours later by Kuwait and Bahrain. Arabi met with Assad on September 10 and left encouraged that the president would act to defuse the crisis. Six weeks later, the scene was repeated, this time by a full-fledged Arab League mediation mission led by Qatar's prime minister, and including the foreign ministers of Algeria, Egypt, Oman, and Sudan as well as Arabi. The "Arab solution" to the crisis now being proffered put the onus on the Assad regime: It was required to end its violence and killing, release prisoners, withdraw the army from cities, allow free access to foreign journalists, open a dialogue with the opposition under league auspices, and accept the entry of a multinational Arab League monitoring mission which would report on compliance with its plan. Damascus's slowness in responding and efforts to limit the number and purview of the monitors, resulted in its suspension from league activities on November 12, as had been done with Libya. Eighteen states voted in favor of the suspension, with only Lebanon and Yemen opposing and Iraq abstaining. That same day, Jordan's King Abdullah became the first Arab head of state to suggest that Assad should step down. On November 27, the league announced the imposition of sanctions on Syria, including the banning of senior Syrian officials from traveling to other Arab countries, freezing Syrian assets in Arab countries and halting financial operations with major Syrian banks. Further sanctions were announced the following week. While clearly unhappy with the turn of events, the Syrians kept the door opened and eventually agreed to receive an Arab monitoring mission. Its very establishment was a novelty. Syrian forces intervening in Lebanon in 1976 had received the Arab League's qualified stamp of approval. Now, Syria was on the receiving end of collective Arab policies though this was hardly a case of collective Arab will being imposed on Syria. The 165-member mission was led by a retired Sudanese general who had been involved in the genocidal actions in Darfur and was clearly sympathetic to the official Syrian version of events. The regime's efforts to manage the mission's itinerary apparently included sending prostitutes to the hotel housing the monitors, secretly photographing them in their own rooms and bathrooms, and posting the pictures online in order to blackmail them. Moreover, a number of monitors were attacked and injured by pro-regime elements. The chaotic nature of the mission led to the very vocal resignation of an Algerian participant, who called it "a farce." The 50-strong GCC contingent was demonstratively withdrawn in opposition to extending the mission's activities into a second month, followed quickly by Jordan's withdrawal, and the operation was closed down. Most importantly, the mission had failed to staunch the bloodshed. Bashar's response to Arab condemnations was predictably dismissive. Much more than them, he declared, it was Syria that represented Arab identity and had advanced Arab interests, politically and culturally. Suspending Syria from the Arab League simply meant that the league had suspended its Arabness. Syria, he insisted, was the victim of an international conspiracy hatched by regional and global powers who, as in the past, wanted to destabilize the country and advance their interests. What passes for the international community, he declared, "is a group of big colonial countries which view the whole world as an arena full of slaves who serve their interests." In response to the mission's failure, the league called for Assad to step down in favor of his vice-president and for the establishment of a national unity government. The plan, officially tendered to the Security Council by Morocco, was endorsed by the United States, the European Union, and Turkey but was vetoed by Russia and China. The veto emboldened the Assad regime to take the offensive to try to stamp out its opponents, employing an updated version of the "Hama Rules." Qatar's emir Hamad bin Khalifa al-Thani suggested that troops from Arab countries be dispatched to quell the violence; the league called for a joint Arab-U.N. peacekeeping force, and Saudi leaders spoke out forcefully in favor of arming the Syrian opposition. Riyadh's frustration with the absence of action was evidenced by Foreign Minister Sa'ud al-Faisal's very public complaint and demonstrative early exit from the Friends of Syria international conclave, held in Tunisia on February 24, 2012, for the purpose of applying additional pressure on the regime and mobilizing support for the Syrian opposition. Failing to achieve a consensual Security Council resolution, the U.N. secretary-general dispatched his predecessor, Kofi Annan, to Damascus in early March, as a specially designated U.N.-Arab League representative, to try to find a way out of the impasse but with no discernible results. As Syrian forces extended their offensive and the death toll mounted, league secretary-general Arabi called for an impartial international investigation into "crimes against humanity" committed against civilians in Syria and prosecution of the perpetrators. The GCC states, for their part, announced the closure of their embassies and called on the international community to "take firm and quick measures to stop the killings, torture, and blatant violation of the dignity of the Syrian people and its legitimate rights." In the many months since the Tunisian produce vendor Mohamed Bouazizi literally and tragically lit the spark that touched off the first of the Arab uprisings, the geopolitical contours in the region continued to be to the Arab states' collective and individual disadvantage. Egypt, traditionally the first among equals among Arab states, has seen its regional weight and influence decline precipitously in the last two decades. Indeed, one regular refrain of the anti-Mubarak protests was that the president was to blame for this deterioration and that a new order in Egypt would restore Cairo to its rightful place in the region. So far, however, Egypt has been consumed with internal problems, and its government's absence from regional issues is even more noticeable. In its stead, the main Arab leadership roles have been assumed by Saudi Arabia and Qatar, a surprising duo given the frequent friction between them generated by Doha's purposefully independent stand and Riyadh's own preference for conflict-avoidance and inter-Arab consensus building. But the recent uncertainties, challenges, and opportunities have compelled them to try to maximize their assets. This comes at a time when a nuclear-aspiring Iran poses a clear and present danger to the existing regional balance of power; when Tehran's primary regional ally Damascus is tottering, and when Washington's dependability appears less of a given to Riyadh. It is against this backdrop that the Arab League has reemerged as an address for regional diplomacy with, perhaps ironically, Western approval. The Syrian case demonstrates that, despite U.S. secretary of state Hillary Clinton's praise of the league's actions and the hopes of liberal Arabs that the organization could help promote a new well-being for Arab citizens throughout the region, the league's leverage remains limited. Increasingly, it appears that among regional actors, the only one that could tip the balance against the Assad regime would be Turkey. If Ankara is drawn even more directly into the conflict, it may well seek some measure of understanding with the Arab League. Thus, notwithstanding its limitations, the league is more relevant to regional geopolitics than it has been in years. Bruce Maddy-Weitzman is principal research fellow at the Moshe Dayan Center for Middle Eastern and African Studies, Tel Aviv University. Rami G. Khouri, "The Arab League Awakening," Agence Global (Greensboro, N.C.), Nov. 16, 2011. "League of Arab States, Tunis Declaration issued at the 16th session of the Arab Summit," Tunis, May 22-23, 2004. Fox News, Feb. 10, 2011; The New York Times, Mar. 17, 2011. Reuters, Feb. 22, 2011; The New York Times, Mar. 17, 2011; The Guardian (London), Mar. 19, 2011. Voice of America News (Washington, D.C.), Mar. 17, 2011; The New York Times, Mar. 17, 2011. See, for example, The Telegraph (London), Mar. 30, 2009. Reuters, Feb. 22, 2011; Bloomberg News Service (New York), Feb. 22, 2011. U.N. press release on resolution 1973, Mar. 17, 2011. Christopher M. Blanchard, "Libya: Unrest and U.S. Policy," Congressional Research Service, Washington, D.C., Mar. 29, 2011. BBC News, Mar. 12, 2011. France 24 TV, Mar. 22, 2011. Curtis Ryan, "The New Arab Cold War and the Struggle for Syria," Middle East Report, no. 262, Middle East Research and Information Project (MERIP), Washington, D.C.
 Bruce Maddy-Weitzman, "Arabs vs. the Abdullah Plan," Middle East Quarterly, Summer 2010, pp. 3-12. Bashar al-Assad, Journalists' Union speech, Damascus, Aug. 15, 2006. The Wall Street Journal, Jan. 31, 2011. The Telegraph, Mar. 18, 2012. Al-Ahram (Cairo), July 13, 2011. Ha'aretz (Tel Aviv), Nov. 1, 2011; al-Jazeera TV (Doha), Nov. 3, 2011. The Guardian, Nov. 12, 2011. BBC News, Nov. 27, 2011. Abdul Rahman al-Rashed, "How can we save Syria?" al-Arabiya News (Dubai), Jan. 31, 2012. The Guardian, Jan. 11, 2012. Bashar al-Assad, speech, Damascus University, Jan. 2012. The Washington Post, Jan. 22, 2012. Los Angeles Times, Feb. 24, 2012. Reuters, Mar. 16, 2012; Day Press News Service (Damascus), Mar. 17, 2012. Marwan Muasher, "A League of Their Own," Foreign Policy, Jan. 11, 2012; Khouri, "The Arab League Awakening." Related Topics: Middle East politics | Bruce Maddy-Weitzman | Summer 2012 MEQ receive the latest by email: subscribe to the free mef mailing list This text may be reposted or forwarded so long as it is presented as an integral whole with complete and accurate information provided about its author, date, place of publication, and original URL.